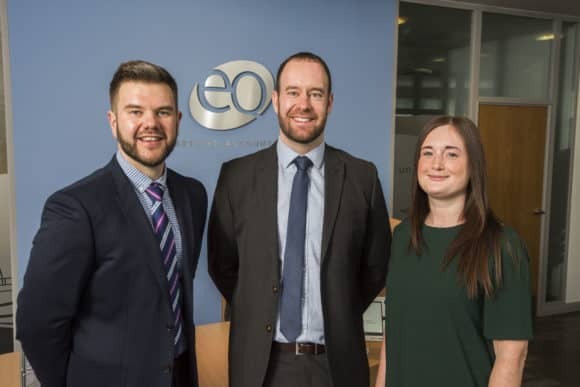 EQ, which has offices in Dundee, Forfar, Cupar and Glenrothes, has promoted three Senior Managers, all of whom undertook their training within the firm, to Principal Managers. Their promotions are effective from 1 April 2019. Rachel Bell, based in the Dundee office, joined the firm as a trainee in 2008. Following her success in the ICAS exams, Rachel specialised in taxation, qualifying as a Chartered Tax Advisor (CTA) in 2014. Rachel has significant technical expertise in corporate taxation, specialising in Research and Development Tax Credit claims. She now heads up the firm’s ‘Transaction Tax’ group, dealing with the purchase, sale or restructuring of a business. Scott Greig, who is based in EQ’s Cupar office, commenced his CA traineeship in 2009, qualifying in 2012. Having moved from the Forfar office in 2015 to strengthen EQ’s agricultural expertise and build relationships with both intermediaries and clients, Scott has been instrumental in the success of the Cupar office over the years and is key to its continued development, both in terms of his agricultural and commercial sector knowledge. Robert Young joined the Forfar office as an office junior in 2003, working his way through the grades and successfully passing his ACCA exams along the way, becoming a Chartered Certified Accountant in 2013. Renowned for his agricultural expertise, Robert specialises in personal taxation, particularly succession planning, inheritance tax and executory taxation. He is also the lead of EQ’s ‘Private Client’ tax group. For more information on the opportunities to join EQ, please visit https://www.eqaccountants.co.uk/careers/.